There's basically an unwritten rule in Hollywood that states that movies are always supposed to feature likeable protagonists. This makes it easy and painless for audiences to relate to and root for them without any complicated moral quandaries (I mean, who wants those, right?). Apparently, however, somehow director John Guillermin didn't get this memo when making 'The Blue Max.' Instead of a typical stalwart hero, our main character is… well, kind of a jerk. Actually he's a pretty big jerk. Thankfully, this potentially risky tactic proves to be rather inspired, and though there are some notable issues here and there, the movie ends up delivering a genuinely interesting anti-war message that is bolstered by some absolutely breathtaking aerial stunt footage. The narrative never soars quite as high as the visuals, but the film's conclusion leaves a surprisingly strong impression, subverting a typical hero's journey into something much more cynical, original, and engaging… even if you do constantly want to slap the main character's smug smile right off of his dumb, grinning face. 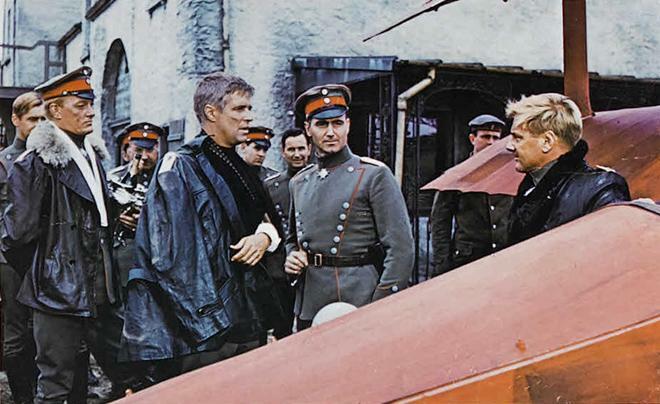 Based on the novel of the same name written by Jack D. Hunter, the script follows an arrogant German soldier, Bruno Stachel (George Peppard), who joins his country's fighter pilots on the Western Front during WWI. Ruthlessly ambitious and determined, Stachel becomes obsessed with outgunning his colleagues and sets out to achieve the most kills in his squadron so that he can win the prestigious Blue Max honor. As a rivalry begins to develop between the young pilot and the aristocratic Willi von Klugermann (Jeremy Kemp), Stachel's pursuits begin to expand beyond just the air, and soon he finds himself trying to woo over Klugermann's lover (Ursula Andress). Now caught in a dangerous physical and emotional dogfight, Stachel will risk everything in order to prove that he truly is the best. Though he lacks much in the way of range and isn't always as convincing as he needs to be, George Peppard plays Stachel with an appropriately vain edge. Egotistical and blinded by his own need to prove himself, the character gradually becomes more unlikeable as the runtime goes on, escalating his cocky attitude the more he climbs up the ranks. With that said, despite his unpleasant personality, he remains an interesting and refreshingly atypical protagonist, and there are fleeting moments when the man does show some signs of humanity, revealing attempts at chivalry and respect toward his enemies. 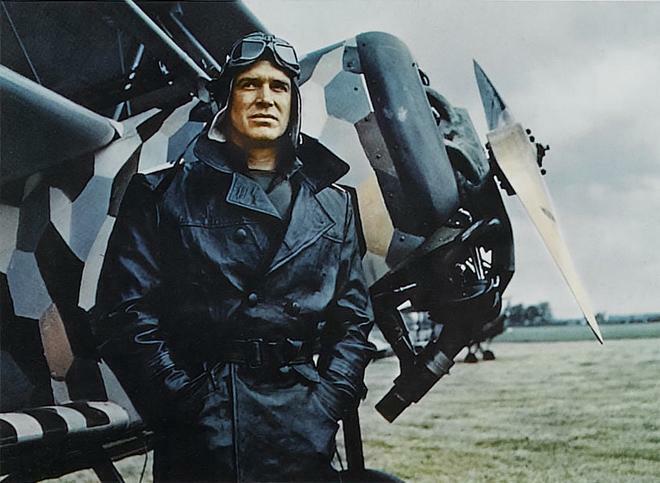 Surprisingly, however, members of his own squadron are not always so lucky, and Stachel's contentious relationship with Willi becomes the source of most of the film's drama. Their competition begins somewhat playfully, but eventually takes on more weighty stakes. Likewise, a good deal of the runtime gets dedicated to Stachel's burgeoning romance with Ursula Andress' Countess Kaeti von Klugermann, and while their paring can be amusing, some aspects of their courtship and its attempts at humor are a bit outdated. Thankfully, outside of some notable lulls in the pace and a few scripting concerns here and there, the movie does manage to soar very high during its numerous aerial battle scenes. These action sequences can be quite spectacular and feature truly impressive stunt work and exciting camera angles, giving the audience a real visceral sense of speed and altitude that takes full advantage of the CinemaScope frame. Unfortunately (but understandably), not all of the aerial footage is filmed in the actual air, and various studio shots and optical composites do tend to stick out like a sore thumb. On the plus side, the filmmakers do keep things rather lively on the ground as well, with an elegant shooting style, a few solid trench battle scenes, and one particularly mesmerizing moving shot during the film's climax. As a crowd of spectators watches one character maneuver a new aircraft, the camera tracks and glides from a low angle throughout the audience, giving us a breathtaking perspective of the soaring plane. And even beyond this impressive sense of spectacle, the narrative's third act actually ends up covering some rather thought provoking themes. As a high-ranking general (James Mason) starts to take advantage of Stachel's growing popularity, the movie shines a light on the exploitative intricacies of the war propaganda machine. To this point, the film's icy conclusion is quite powerful and masterfully staged, offering a pitch perfect escalation of tension and danger through some genuinely gripping direction. As a whole, the script is a bit uneven, but these final moments really do leave a strong impression, offering a surprisingly interesting commentary on wartime politics and manipulation. Handsomely composed and filled with highflying action, 'The Blue Max' is an old fashioned Hollywood war epic that offers an impressive array of pre-CG aerial stunt sequences. Some elements of the narrative are a bit forgettable and Peppard's performance can be a little too one-note, but the battle scenes are thrilling and the script's atypical protagonist and underlying anti-war message ultimately prove to be engaging. It's unlikely that you'll ever find yourself rooting for Stachel in his quest to earn the coveted Blue Max award, but it turns out that unlikeable characters can still be satisfying leads. That is, if you can keep yourself from slapping the TV screen. 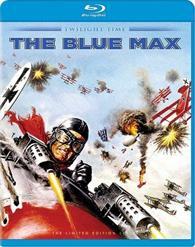 Twilight Time brings 'The Blue Max' to Blu-ray on a single BD-50 disc that comes housed in a keepcase. Like all of the company's releases, the disc is a limited edition with a run of 3,000 copies. An insert with an essay by Julie Kirgo is included as well. The movie is provided with a 1080p/AVC MPEG-4 transfer in the 2.35:1 aspect ratio. Though quite impressive in many regards, the image is a little inconsistent and there are some potential issues here and there. The source print has been cleaned up very well, with no real signs of age or damage. Likewise, a very light layer of grain is usually retained, though there are a few odd shots here and there (usually SFX related) that appear a bit heavier. With that said, the surprisingly faint grain structure occasionally looks a little too light, and there is a slightly smooth, glossy quality to some textures and faces that gives me some pause. Thankfully, if some digital filtering was applied, the process has been used pretty sensibly, and overall detail remains very strong. In fact, there are numerous shots that are really quite striking, offering life-like dimension and clarity. Of course, the HD presentation does make it much easier to spot some of the film's limited optical effects work, making studio shots and matte lines painfully obvious. Colors are solid (Peppard's blue eyes pop nicely), but the palette has a comparatively faded look with a slightly teal hue. Fleshtones also veer a bit toward orange. Contrast and black levels are balanced well, but indoor scenes appear a tad dim. For the most part, 'The Blue Max' looks very good on Blu-ray, but the presentation is a little uneven with slightly wavering detail and possible signs of minor processing. The film is presented with an English DTS-HD MA 5.1 track along with optional English SDH subtitles. It can't compete with modern efforts, but the audio can be appropriately aggressive when it needs to be. Speech is relatively clear and well-prioritized throughout, but dialogue does have a comparatively muffled quality in some scenes. The opening battle sequence is surprisingly muted, with gunshots and explosions that offer little impact. Thankfully, however, the rest of the track offers a much more robust experience and later dogfights and action scenes carry a heftier kick with solid range and directionality across the front sound stage. Spinning propellers, firing machine guns, and falling bombs all provide a decent low frequency jolt, though bass activity is not on par with modern releases. With that said, surround activity is sadly sparse, and for the most part, the side speakers remain pretty silent throughout. On the other hand, Jerry Goldsmith's rousing score does come through beautifully, and the music is spread well around the room. Age related crackles and pops are absent, but some negligible hissing is audible from time to time. Isolated Score Track #1 (The Complete Score) – When this track is toggled, audiences can watch the film with Jerry Goldsmith's isolated musical score in DTS-HD MA 2.0. Isolated Score Track #2 (Alternate Music) with Commentary by Film Historians Jon Burlingame, Julie Kirgo, and Nick Redman – The participants discuss Goldsmith's musical score and the tension that arose between the composer and director. Likewise, the group also traces the film's production while elaborating on its anti-war content, casting, visuals, amazing aerial footage, stunts, and characterizations. Alternate pieces of Goldsmith's score are played periodically as well, leading to occasional breaks in the conversation so audiences can hear the music without distractions. Theatrical Trailer (SD, 3 min) – The film's theatrical trailer is included in standard definition with Dolby Digital 2.0 sound. 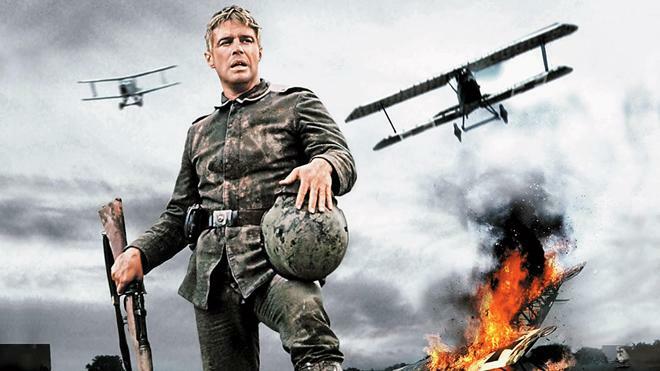 'The Blue Max' is a very solid war film that features some genuinely impressive aerial stunts. The script and acting can be a little uneven, but the movie ends on a strong note. The video transfer is mostly strong, though there are some occasional inconsistencies, and though the audio isn't as robust or enveloping as modern action tracks, the mix does a nice job of complementing the visuals. The isolated score track highlights Goldsmith's stirring music and the included commentary track offers some worthwhile production trivia. Like all Twilight Time releases this release is a limited edition and its comparatively steep price might seem a bit high, but the film itself holds up well and this disc is certainly worth a look.